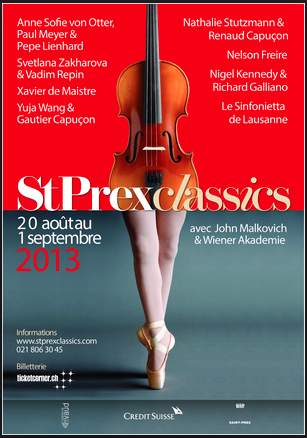 Super excited to be performing at the amazing St Prex Classics festival, Switzerland on 31 Aug & 1 Sept with Nigel Kennedy and Richard Galliano. What a privilege to witness two absolute masters of their craft in collaboration. Also very humbled that we will be opening the show with my chamber arrangement (for solo violin, oboe, string quintet and piano) of Vaughan-Williams’ ‘The Lark Ascending’! The incredible venue ‘LUNA’, purpose built for the festival, features a balloon like roof that lights up like a moon looking over St Prex. Some behind-the-scenes pics here. This entry was posted on August 30, 2013 by sonjaschebeck. It was filed under Arrangements, Performance and was tagged with Lark Ascending, Nigel Kennedy, Richard Galliano, St Prex Classics, Vaughan-Williams.